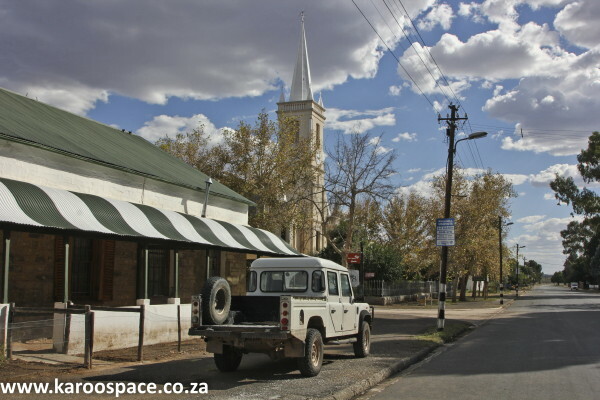 Linda’s Karoo Boerseep, ready packed. 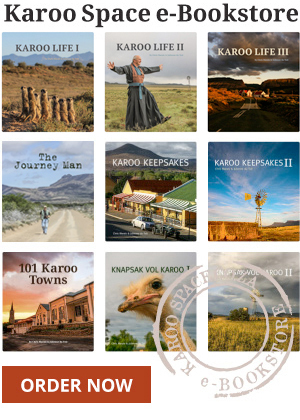 Witnessing the making of boerseep by a Karoo farmer’s wife is like being in the presence of household magic. While we were in Murraysburg recently, our friend Adri Smit said she wanted to introduce us to Linda van der Berg. Linda was just about to make a new batch of her famous boerseep (farmer’s soap), and was happy for us to come through and take photographs of the process. Usually it entails a fire and vast pots nearly large to cook a small missionary. Also, it happens outside. Linda explained the reason with a slightly rueful face. But there was too much wind outside that day, so she was making it in her kitchen. While the ingredients were cooling, we all chatted away, almost forgetting about why we there. Adri told us about how amazing the heirloom vegetables were in and around the town. Murraysburg boasts exceptional watermelons, garlic and spanspek cultivars. Linda told us about her other role – that of resident cakemaker. “If you even show any bit of keenness or talent, that’s what you end up doing in a small town.” She is also part of the local supper club. Suddenly everything was at the right temperature, and Linda swung into action. Making boerseep is all a matter of timing, temperature and ratios, with the hot caustic soda (lye) and hot beef tallow mixed carefully once at the right temperature. There may have been rainwater in the mix too. 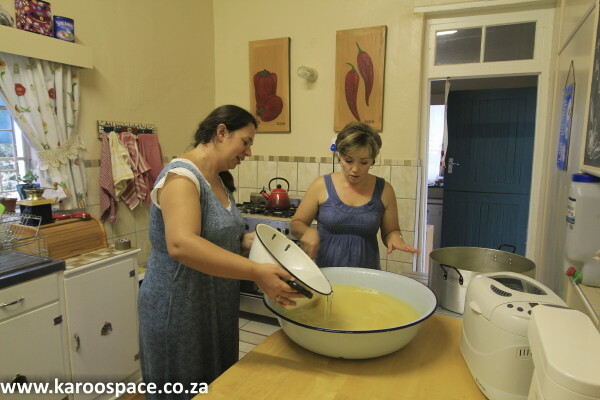 Adri (left) and Linda slowly add the caustic soda to the rendered beef fat. No matter how carefully it is poured and mixed, caustic soda burns the skin and any little splashes are a little painful and itchy. Adri and Linda bravely took turns stirring as the magic began. The caustic soda changes the molecular structure of the fat, a process that takes the better part of an hour and no interruption in stirring. From being clear yellow, the fat turned a creamy consistency, then like condensed milk, then like fudge. Only at the end, when the alchemy is complete, did it not burn the skin any more. Linda poured it carefully into a drawer lined with plastic. She would leave it for a week to completely dry out, before cutting it into blocks, packing it and selling it. There is an endless demand for the stuff. 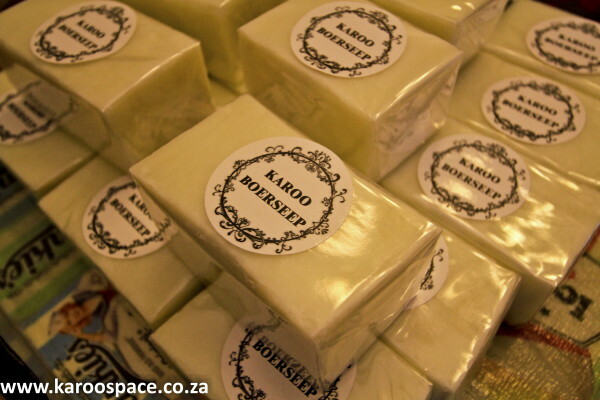 Boerseep, incidentally, is not meant to use on the body – it is a laundry soap. Unlike commercial laundry soaps, boerseep never bleaches the fabric, said Linda. But it does remove all kinds of organic stains – grease, red wine, blood, tomato, gravy, grass and mud. First wash the stained item in warm water, rinse and add boerseep lather to the stain. Hang it up outside. Once dry, rinse out the fabric. The stain will be gone. Linda’s soap is on sale at Kweperlaan and various other places in and around Murraysburg.